One Google Lunar X Prize competitor’s design, built by Astrobotic Technology Inc., a Pittsburgh, Pa.-based company. A new generation may see a moon landing broadcast on live TV in the next couple of years. Teams of engineers are rushing to put a robotic spacecraft on the moon in the Google Lunar X Prize competition, which is offering up to $30 million in prize money for the lunar feat. This week, the Science Channel and Discovery Channel announced that they will cover the moon race, from testing to the liftoff to the live lunar landing of the winning team. To win the $30 million in main Google Lunar X Prize money, privately funded teams must be the first to successfully land a robot on the surface of the moon, have it travel at least 1,650 feet (500 meters) and send video, images and data back to Earth. Teams must complete these goals Dec. 31, 2015 to have a shot at taking home the overall prize. The groups also have a chance to win smaller bonus prizes of up to $1 million if they complete certain milestones, such as creating the hardware and software that would enable a soft landing on the moon. 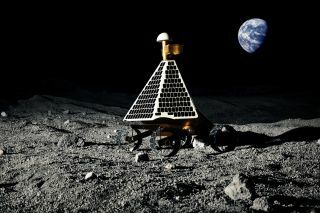 Currently, 18 teams are in the running, including the United States-based groups Astrobotic, Moon Express, Omega Envoy and the Penn State Lunar Lion. The purpose of the competition is to stimulate innovation, spur the development of lunar resources and advance private spaceflight technology, X Prize officials have said. Engineer and entrepreneur Peter Diamandis founded the X Prize Foundation in 1995 to offer $10 million to the first private team to build and launch a spacecraft capable of carrying three people to 100 kilometers (62.5 miles) above Earth's surface, twice in two weeks. The Mojave, Calif.-based Scaled Composites, a company owned by aerospace designer Burt Rutan and backed by billionaire Paul Allen, co-founder of Microsoft, won that competition (later named the Ansari X Prize) in 2004. The X Prize Foundation has since gone on to offer more X Prize challenges in the fields of spaceflight, medical technology and automobile fuel efficiency, among others. "The $30 million Google Lunar X Prize offers all the ingredients of fantastic television; stakes, competition, big characters, and mind-blowing visuals," Eileen O’Neill, group vice president for Discovery Channel, Science Channel and Velocity, said in a statement. "When the winning craft touches down on the moon’s surface, it's going to trigger buzz and inspiration all over the world."